Feeding system engineering starts with getting the ‘basics’ right. A site survey, determining the best solution for the factory, applying JOA’s technology concepts, followed by GCM™ V0crit model to optimize the conveying velocity and tobacco loading, provides clear understanding of the yield improvement opportunity. The feeding system aluminum piping is standardized at 110 and 125 mm diameter. (Special 150 mm). Bends are available in both stainless steel and aluminum. 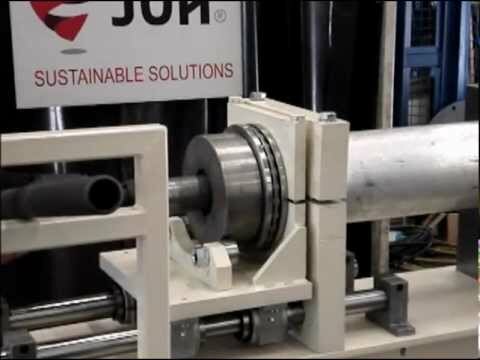 The specially designed ‘easy rolling’ process provides fast connecting of the flanges to the pipe, without introducing any additional material such as adhesive or welds. Additionally the mobile ‘easy rolling’ unit is used to upgrade existing piping networks with new flanges at location. The rolled flanges provide a very reliable connection, exact alignment and an air tight O-ring seal. A robust feeding system design, next to correct piping alignment and bends, encompasses an optimal routing (GCM™ balancing), combined with a smart and ergonomic blend selector design. The JOA site survey team determines the optimal routing, in close cooperation with the customer. Advanced GCM™ modeling combined with 3D engineering provides early stage communication and decision making. Finally all required information for the dust collector / fan room is gathered (Capacity, pressure drop and control system). The driving force of the tobacco conveying is generated by a Dust Collector/ Fan combination, dedicated to a group of makers. The JOA-JDF serie filter units are highly efficient pulse on demand, compressed air cleaned dust filters, capable of withstanding the required negative pressure for controlled tobacco conveying. Integrated with our fit for purpose efficient direct driven fans, with frequency converter, the installation provides adequate ‘power’ for controlled feeding. 1. Flexible, extendable, compact and ergonomic design. 2. Smart tracking and tracing applying node communication technology, including feeding interlock. 3. Generating operator advice (unique pipe and bend #) to build the optimal connection. 4. Capability to communicate blend specific conveying settings to the FBFC control unit.